Tree nut allergy is more common in older children and adults than in infants. What are the symptoms of tree nut allergy? Usually symptoms begin straight after eating the nuts. Most symptoms are mild. They include a rash (hives or “nettle” rash), swelling of the lips or around the eyes, and itch. Some children have an itchy throat, others feel sick, vomit or have diarrhoea. Severe reactions are much less common but include difficulty breathing (with wheeze or swelling that blocks the mouth or throat), feeling faint or dizzy (anaphylaxis). Sometimes symptoms are delayed and may include flares in the child’s eczema or stomach pain. How serious is tree nut allergy? Most people with tree nut allergy only have mild reactions. Severe reactions affecting the breathing can occur, these are of particular concern in those with bad asthma and will need urgent medical attention. Will my child be allergic to nuts other than the one causing the reaction? 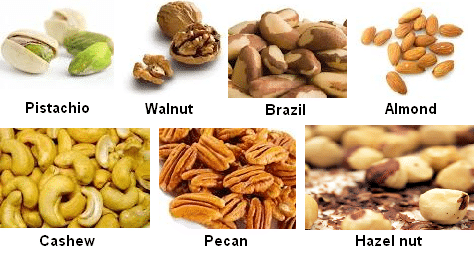 Some nuts are from the same family and may also cause reactions (this is known as cross-reactivity). These cross reacting nuts should be avoided. Cashew and Pistachio nuts cross react, as do Pecan and Walnuts. Children with nut allergy should never eat nuts from a mixed nut collection. Chestnuts, coconut and seeds like pine nuts, sesame and sunflower seeds etc generally do not need to be avoided but your specialist will advise you if avoidance is necessary. It is often easier to avoid all nuts in childhood so as to avoid confusion for other carers such as family members, friends and school staff. As children grow older and become more independent they may want to know exactly which nuts they can and cannot eat. This needs to be discussed with your allergist who may advise repeat allergy tests as a precaution. How do we diagnose tree nut allergy? The diagnosis of tree nut allergy is based on the history of a typical reaction after contact with tree nuts. Positive allergy skin prick or blood IgE tests support the diagnosis, but should not be done if there is no history of reactions, as some people can have positive allergy tests but can tolerate tree nuts without getting a reaction. Skin prick tests are safe and can be done in clinic provided that anti-histamines have not been taken for a few days. Blood tests are not affected by anti-histamines but the results are only available in a week or so, after the clinic appointment. If the diagnosis is uncertain an oral tree nut challenge is sometimes recommended. How can my child avoid tree nuts? Tree nuts like cashews, pistachios, almonds and hazelnuts can be hidden ingredients in food, particularly in Asian, Chinese and Thai food. Hazelnuts, Brazil nuts, cashews and almonds can also be found in baked sweets and chocolates. Unpackaged foods in bakeries and delicatessens that are sold alongside foods containing nuts may be contaminated with tree nuts and so should also be avoided. You should read the ingredients list on pre-packaged foods and ask for the chef’s reassurance in restaurants. Ringing the food outlet to get information before planning a meal can avoid disappointment. Remember it is often easier to avoid all nuts than advise carers at school, after schools clubs and extended family and friends to avoid just some nuts. A written management plan will be given in clinic. Allergy medication should be available at all times. If tree nuts are accidentally eaten, get the child to spit it out if possible and give an antihistamine. Is tree nut allergy life long? Yes, tree nut allergy is life long and hence the avoidance will have to be life long. There is no cure for tree nut allergy at present.